What is better than this? : Avon calling! I'm not so sure I am OK with this. These lovely painted toes are those of miss Paige. And if you are counting, she is all of 2 years and 1 month old. Every time I ask her about them she gets so fired up! 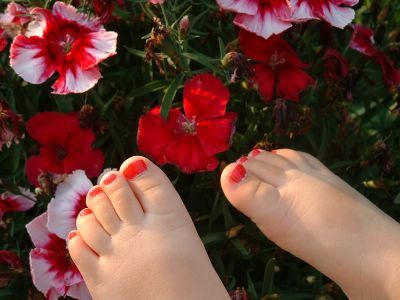 "Mommy painted toes! Whweeew wheew!" she tries to imitate Becky blowing them dry. So cute. Very, very very cute and I love them!! It makes me want to smooch them up (in a mommy-type way).